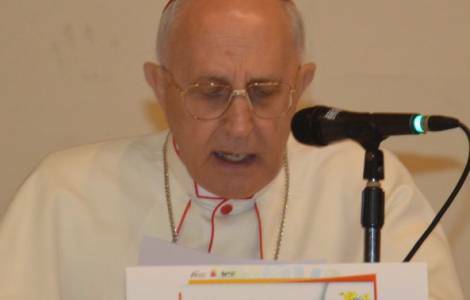 Mongomo (Agenzia Fides) - "My presence among you is the manifestation of the solicitude of the Holy Father and of the Universal Church toward this Church-Family of God. In this sense, I would like to express the support of my affection and my prayer for the long and beautiful path you must carry out to accomplish the purpose for which the Holy Father granted the creation of your Diocese". This is what the Prefect of the Congregation for the Evangelization of Peoples, Cardinal Fernando Filoni said in the meeting with priests, religious men and women of the new diocese in Mongomo in the afternoon of May 22 (see Fides 17/5/2017). "You are called to live the radicality of the Gospel following the chaste, poor and obedient Christ ". The Cardinal then appealed to the commitment of all priests, religious men and women for the new diocese: "The involvement of all of you, as first collaborators of the Bishop, is indispensable for starting the Diocese. I urge you to live your identity and your priestly ministry in full communion with the Bishop, whom the Lord has chosen and established as the Father and Shepherd of this Church. Love the Diocese. Be ready to cooperate faithfully and generously in the diocesan and pastoral life, by sharing your priestly and pastoral qualities as well as your organizational skills. Feel all fully responsible to give impetus to the new Diocese, and ensure its good pastoral leadership". After quoting some behaviours that "reduce the effectiveness of pastoral action and obscure the image of the priest as guardian of the flock of God, and the image of the religious as a witness of the Chaste, Poor and Obedient Christ", Cardinal Filoni specified that "a priest must be in love with Christ. The moral authority that sustains the exercise of your ministry can only come from the holiness of your life ... Consequently, you must live your priestly and religious identity faithfully and with joy. This loyalty concerns both poverty, obedience, and chastity". Focusing on these three aspects, the Cardinal said among other things: "True poverty teaches us to be in solidarity with our people and to share in charity. It also warns us of material idols that obscure the authentic sense of life". "Obedience to God also passes through human mediation. The will of God is authenticated by the Church. Obey your Bishop as well as your Father. Obedience is a life in the logic of the Gospel". "Chastity must be 'fruitful', that is, chastity that translates into spiritual paternity and maternity; and in community in communion and collaboration". AFRICA/CENTRAL AFRICA - Assault against the Comboni nuns: "The goal was the loot, not religion"